Peonies are so hot for weddings right now, and its easy to see why. The vibrant color on these hot pink blooms is absolutely stunning and the large size of peonies allows just a few flowers to go a long way, giving you some great bang for your buck. Not to mention, they have simply got to be one of the most beautiful flowers ever created. Its easy to work some magic when peonies are involved because the size and color of the flower packs a powerful visual punch. In this design, clear glass cylinder vases elevated on ornate silver pedestals are filled with water into which one white floating candle is inserted. A cluster of peonies is displayed near the pedestal, lower down on the table. 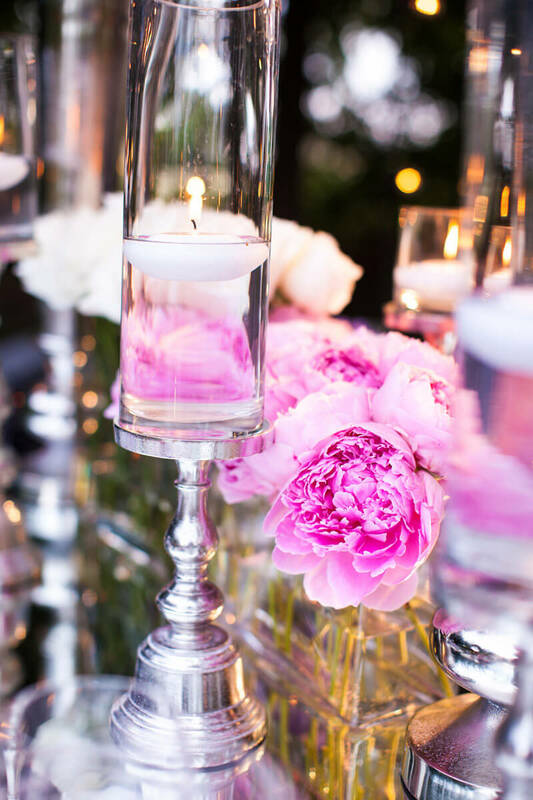 In the background, a container arrangement featuring a cluster of white roses offers some dramatic contrast to the hot pink peonies. Overall, not at all a complex design. In fact its a great example of how much you can do with simplicity – yet it looks amazing. See how easy it really is? Now you’re ready to try a little DIY.